The art teacher started the lesson with lines and circles. Two parallel lines and two circles with one smaller circle tucked inside the larger one. Step by step, she had her students each draw their own clock. She taught them about perspective. As the little Picassos finished up the lines and numbers on their clocks they could pick their favourite time of the day and draw hands on the face. She made the point that twice a day their clocks would be absolutely right. There are 1,440 minutes in a day and for two of them their clock would be telling the right time. Goes to show you, we really don't have much control over our own days. Everything we create has come from something. Everything we do depends on the breath given to us. Every bit of love we give comes from a Love that abides in us. We think we can plan and control our lives to the nth degree, but just look around at your circumstances and you'll see much of it is out of reach of your control. We even dare to believe that we can choose God. His Word says the exact opposite. We cannot choose God. He chose us even before time began, from before the foundation of the world, before life was breathed into man. He chose us to bear fruit. To spend our lives growing love. Not to fill up all our time trying to be right or do right but to be in a relationship with the Creator of every thing and who exists outside of time. So give yourself a break. Stop trying to fix yourself. Turn your eyes off your own self and look to the One who is greater than time. He makes all things right and beautiful in His time. The Good News is He wants you so much He stepped into time so we could be with Him for all eternity. He wants you to abide in Him and grow in His love. Spreading His love like a never-ending circle and like lines that go on forever. Absolutely right with Him all the time. Never forgetting how He chose you in the first place. Especially this part -So give yourself a break. Stop trying to fix yourself. Turn your eyes off your own self and look to the One who is greater than time. 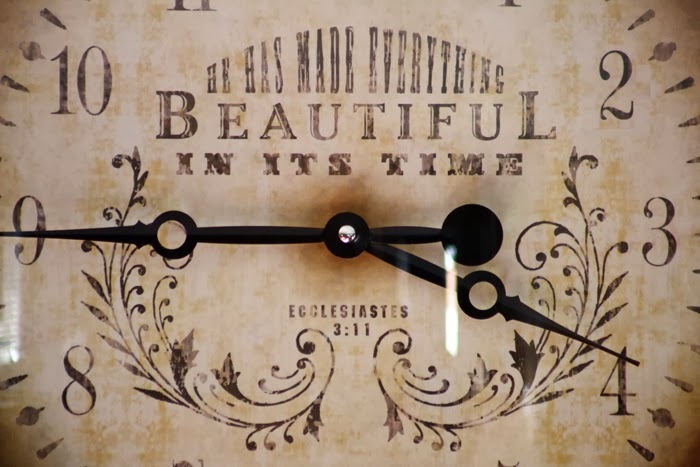 He makes all things right and beautiful in His time.